Normally I’d just move on hoping for a new tweet from @CuteEmergency or @OhMyCorgi. But today was different. I felt compelled to respond because something happened earlier today that proved why working for free pays off. A new small business was in the process of getting their storefront setup last winter. I have a somewhat selfish interest in seeing them succeed because I like what they do and the people there (who I didn’t know at first). I felt they could use the video medium in some of there marketing efforts so I offered them my services, 100% pro bono (aka for free or literally, “for the public good”). I spent an hour talking with them about what they need and sketched out some ideas before deciding on one. I came back the next week and shot a video for them, which took less than two hours. They were in no rush so I took my time editing it. I spent maybe 10 hours editing it from my couch over the course of a few weeks in my spare time (there’s a lot more spare time during the baseball offseason). I delivered a fairly good-looking product IMO and they were very pleased. Since then we’ve stayed in contact and I’ve reaped some non-monetary rewards from them as well. I spent ~13 hours doing work for free for a company in need and they were sincerely thankful for it. Maybe one day they’ll ask me back to do work for them again. I believe they would not ask for it to be free, even though I might do it for free again. Regardless, something much better happened. I got a call this morning from them saying they referred me to a separate (and much larger) business. The gig is worth significantly more than a few 13-hour projects for a small business. Note: This section would become a grammatical train wreck if I don’t make it a list. Reel material – For anyone without a ton of non-school projects, this is important even if you don’t put much importance on a reel (I have a ton to say about the value of reels in a future post). Not only is the reel material useful but the real life interactions with clients gives you experience you can’t get in school. Just curious, any recent college grads out there reading this? Could you use more non-school projects on your reel? Try new things – Whenever I work for free I make sure to try out crazy shot angles and weird editing techniques. Most importantly I have fun with it. I can’t always enjoy the moment when time is tight and tensions are high during a shoot or when I’m in the editing bay for a paying client. I can do that with free work though. I hone my skills and experiment to better know what I can or cannot do when I’m doing a project for money. It feels good – Don’t undervalue this. It feels good to open up the world of video to a new person/company. It feels good to offer your services with no strings attached. It feels good because of point #4 below. They are thankful – I’m always a welcomed guest/patron for those that I do free work for. If I did bad work, I might not be so welcomed. But I strive to give them grade A work. Not only are they thankful but we usually become friends too. Also, you tend to get discounts/free goodies on occasion in return (I can’t count the amount of free beers I’ve had and free baseball games I’ve been to in return for doing various forms of free work). No taxes or paperwork – Do I need to say more about this? Referrals and future work – This is the most important one but the one you should worry about the least. Remember, you did this with no strings attached. Hopefully you’ll do future work for them. If they ask you to do it for free, you can if you want to reap any of the benefits above. Or you could tell them no. Or you could ask if they would pay you… Do not expect them to ever give you future work or refer you. You will only be let down if you do and they don’t do it. I’ve done free work and gotten future paid work from them. I’ve done free work and gotten referrals. I’ve been asked to work again for free. And I’ve also never heard from them again. For the record, I have my day job from working for free. I taught Tae-Kwon-Do for many years for free at a free school my dad and I ran. Nearly a decade later I got a call from a man who we used to train. There was a need to create a video department at the company he was at. I’ve been running that video department now for a year and a half. Non-chill and/or desperate people – The success of the video should not make or break the company. When I’m approached by them – If I’m approached about doing work by them I usually give them my rates. A third party telling me that they could use my help is different though. I must approach them about doing work. I’ve gone into projects with the intention of doing it for free then they ask me how much. When it doesn’t improve any situation – This can be social or my skillset. If I don’t find these people likeable and/or my skillset doesn’t improve, I’m not doing it. Example: If the people are borderline likeable and they want a talking head and for me to use some vertical b-roll their nephew shot, I’m not doing it. When it’s not convenient – I will not work unless the timing is convenient for me. If I have a lot going on at home or at work, it’ll have to wait. They should understand and if they don’t, then they aren’t getting my free work. You can easily get taken advantage of working for free. I hope this never happens to you but it can. 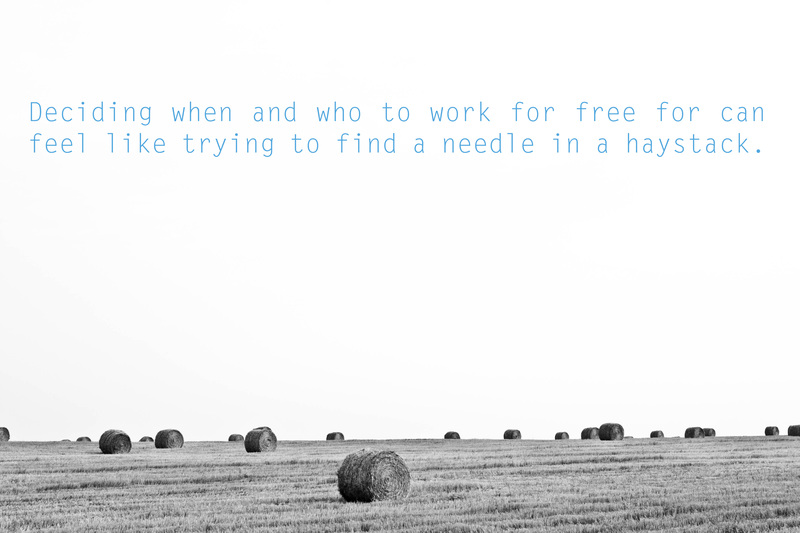 It’s happened to me and that’s why I have such strict rules about when I choose to work for free. But working for free is really beneficial. You get to try new techniques, make new friends, get demo material and it feels really good. You have to decide for yourself though. What’s your stance? Do you work for free? Why or why not? If you think someone could benefit from this post do them a favor and share it! Make sure to sign up at the bottom of the page to receive email notifications when I come out with new posts. Most weeks I publish an in-depth post like this one on Wednesday and a quick video tutorial on Friday on my YouTube channel. Love your approach to this and completely agree. Some of my favorite collaborators have come from free work situations. When I see the project as a way to make new connections and progress as an editor, that is payment enough for my time. But these points are essential to making the decision. There has to be a challenge in the project and a need for it on my reel to justify it. Sometimes it is experience with a new NLE that I want to gain without the pressures of a paying client behind me. Sometimes it is a style that I have not worked in before and I want to figure out the grammar of that style with plenty of time to experiment and make mistakes. Sometimes I want a project for my reel that will diversify it and keep me from being pigeonholed. These opportunities don’t come from current clients so I need to go seek out alternative projects to learn from. That all being said, I don’t believe in taking on free work as more than 20% of your workload or in doing it for a new client who “promises future work” or “exposure” as a form of payment. These guys are purposely trying to game the system and take advantage of people for budget reasons. There are plenty of non profits who need the help or folks with passion projects to fill my time. I’ve been toying with the idea of learning Premiere just for the fun of it. I can’t believe I didn’t think of using free work to test it out! The key is never to expect future work through free work. It’s kind of like unconditional love — do it for the sake of doing it and expect nothing in return. If I buy my wife flowers I don’t expect her to buy me beer the next day. If so does then awesome but if not I’m not upset. The same should go with free work — have no expectations of reciprocation.